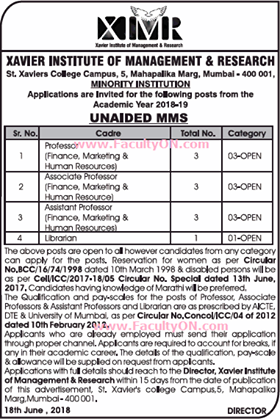 Xavier Institute of Management and Research, Mumbai has advertised in The Times of India newspaper for the recruitment of Professor/Associate Professor/Assistant Professor jobs vacancies. Interested and eligible job aspirants are requested to apply within 15 days. Check out further more details below. About College: “Character Competence Commitment” are the three cornerstones on which the Xavier Institute of Management & Research (XIMR) stands. Our avowed mission is to develop leaders for global business with these qualities, leaders who will make a difference to their organization and society. XIMR is a premier Jesuit B-school providing top quality management education in the city of Mumbai, and the western region of India. Our heritage building with its vibrant students, speaks the language of a rich history in the field of education, befitting the world’s largest education network. We are a B -school that continues to weave excellence into the fabric of our rich heritage.